Every year, nearly 900 people are killed and nearly 76,000 people are injured in vehicle crashes during snowfall or sleet. Each year, 24 percent of weather-related vehicle crashes occur on the snowy, slushy or icy pavement and 15 percent happen during snowfall or sleet. 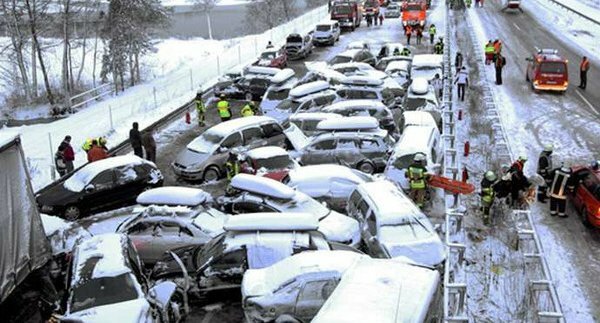 Terrifying car accidents in wintry weather such as blinding squalls have killed nearly 4,000 Americans over the past five years, a new survey found. Survivors recount scary tales of cars and trucks flying like huge missiles around them. While we usually think of tornadoes or floods as the deadliest weather hazards, car accidents kill more Americans each year than any other weather danger. And winter weather can create especially deadly risks for drivers. Slippery or snow-covered roads, reduced visibility, and bitter cold: these are all conditions that can make driving difficult and even dangerous during cold weather months. Winter also brings an increased risk of getting stuck in your car, so dress warmly before heading out. Oil: Check that oil is at the proper level. If stuck: Tie a fluorescent flag (from your kit) on your antenna or hang it out the window. At night, keep your dome light on. Rescue crews can see a small glow at a distance. To reduce battery drain, use emergency flashers only if you hear approaching vehicles. If you're with someone else, make sure at least one person is awake and keeping watch for help at all times. Without a doubt, Safety is 24/7. To have a Keynote Speech on the same topic (Safety is 24/7), contact us today to schedule your date.